What Day Of The Week Was January 6, 1500? 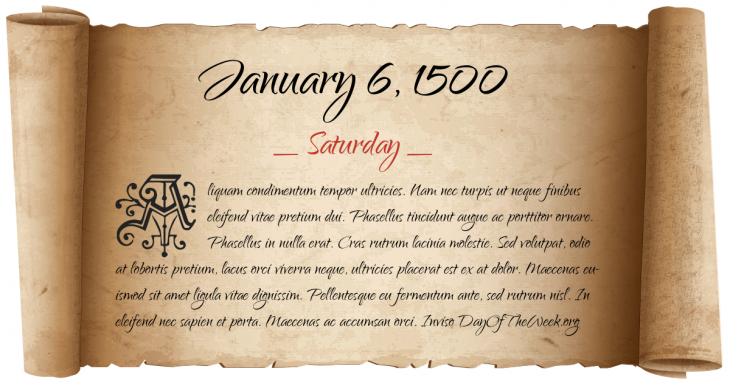 January 6, 1500 was the 6th day of the year 1500 in the Gregorian calendar. There were 359 days remaining until the end of the year. The day of the week was Saturday. The day of the week for January 6, 1500 under the old Julian calendar was Monday. Did you notice the difference with the Gregorian calendar? A person born on this day will be 519 years old today. If that same person saved a Penny every day starting at age 4, then by now that person has accumulated $1,882.09 today. Here’s the January 1500 Gregorian calendar. You can also browse the full year monthly 1500 calendar. A note to students, teachers, scholars and anyone else passionate about this topic. As stated in the front page, this website is using the Gregorian calendar as the basis for all “day of the week” computation whether or not the Gregorian calendar is relevant for the date in question (January 6, 1500). Educators should point out the primary reason why Pope Gregory XIII introduced a new calendar system in October 1582. That is, to make the computation for the annual date of Easter more accurate since it is the foundation of the Christian faith. Even with that purpose in mind, the Gregorian calendar too will become out of sync. It has a known approximation error of about one day for every 7,700 years assuming a constant time interval between vernal equinoxes (which is not true). This is better compared to the one day for every 128 years error of the Julian calendar.